The 30 inch I30 Thoroughbred gives you the best combined features of the Workhorse and High Speed 30 laminators with the features that customers have requested. A powerful motor, larger heat shoes ( 2 x 2000 watt Heaters), and a high performance cooling system allows you to attain speeds of up to 65 fpm at a fraction of the cost of other comparable production machines. Do you have high volume laminating needs, but a budget that won't allow for an expensive high-speed laminator? 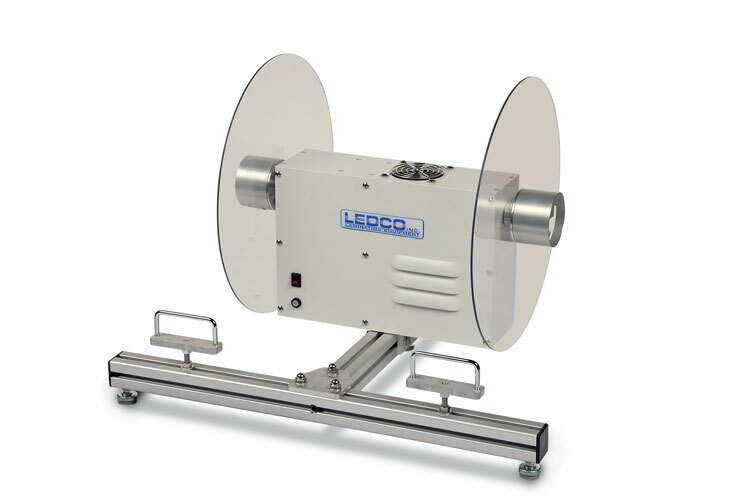 The high performance I30 laminator from Ledco could be the solution for you. This I30 Thoroughbred gives you the best combined features of the Workhorse and High Speed 30 laminators with the features that customers have requested. A powerful motor, larger heat shoes, and a high performance cooling system allow you to attain speeds of up to 65 fpm at a fraction of the cost of other comparable production machines. Because of the larger heat shoe surface (2 x 2000 watt heaters), built-in chill rollers for contact cooling, and precision slitters, the new I30 Thoroughbred can double or triple the production levels of an HD-25 Workhorse. Contact cooling removes excess web heat quickly, allowing faster lamination speeds. Variable speed control allows this laminator to be hand fed or easily adapted to a variety of feeders. 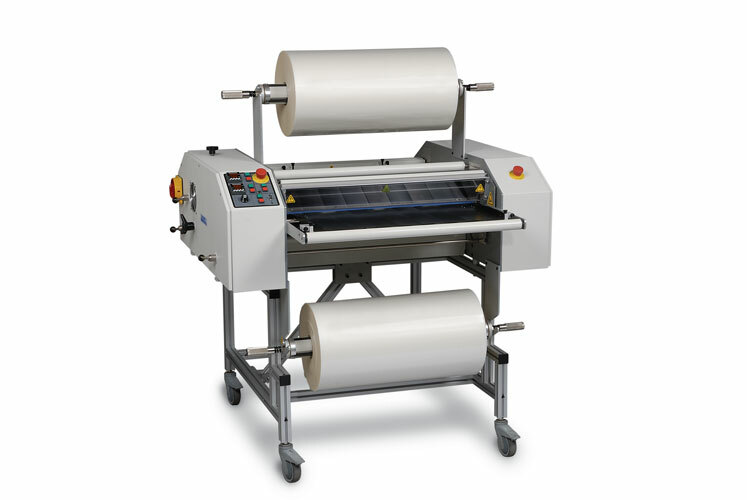 The Thoroughbred laminator is designed to laminate with all films. Operating on 220 volts and 50 amps, the Thoroughbred is designed to provide years of service with minimum maintenance. The unit includes intelligent heat controllers that display the set temperature and the actual temperature. A microprocessor anticipates the heat demand of each job and maintains the actual temperature within a few degrees of the set temperature. Other features include a swing-away top heat shoe, built-in retractable slitters, and a standard precision feed tray. In addition, the Thoroughbred offers laminating and pull rollers covered in silicone rubber for superior release quality, higher lamination quality and easier cleaning. Dual tension knobs for each supply roll are easy to use and provide as little or as much tension as needed to keep work wrinkle free. Intelligent heat controllers display both the set temperature and the actual temperature. The microprocessor in the control quickly learns to anticipate the heat demand of each job and keeps the actual temperature within a few degrees of the set temperature. Laminating and pull rollers are covered with quality silicone rubber for superior release quality, higher lamination quality and easier cleaning. Swing-away top heat shoe is Teflon coated to reduce film abrasion. Built-in retractable slitters save an enormous amount of cutting time by trimming away side scrap during the lamination process. The two heads can be adjusted independently with great precision. Dual tension knobs (clutches) for each supply roll mandrel are easy to use and provide as little or as much tension as needed to keep work flat and wrinkle free. Easy access controls are conveniently located and grouped for effective operation. A safety shield is built into the top heat shoe to safeguard the operator. Rear anti-wrap shield covers rear pull roller to prevent film wraparounds. Both upper and lower rollers are driven to minimize the wrinkling or curling that can occur when one one roller is driven. Forced air cooling with built in chill roll system provides contact cooling necessary for excellent quality flat lamination at higher speeds. Standard precision feed tray has both left and right side guides. This unit can be either hand fed or easily adapted to a variety of feeders. Footage counter enables accurate measurement of film. Additional slitters permit multiple-up cutting. Max Film Roll Diameter 22"
Weight / Shipping Weight 600 lbs. / 795 lbs.